Elevator mid-top boots with upper made of fine black full grain leather and sole in real leather. 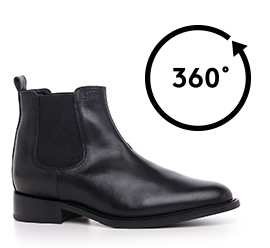 A Chelsea boot with a distinctive character featuring a clean design and fine attention to detail. The inner elevator system is able to increase height by up to 4 inches (10 cm).